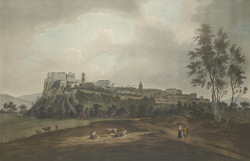 View of Stirling town and castle. It is not known when a castle was first built on this site however the earliest known records with references to a castle here date to the early 12th century. Generations of Scottish Kings have added to and altered the stone castle at Stirling. James III built a great hall, with 5 fireplaces and a hammer beam roof, James IV built a Renaissance style Palace with rooms encircling an open court and James VI built a beautiful chapel for the christening of his son Henry in 1594.